Enrico Gavagnin (Bath – Maths – PhD student) – Investigating mammalian embryonic cell migration with multiscale stochastic models. Jennifer Owen (Bath – Biology and biochemistry – PhD student) – “Understanding zebrafish pigmentation patterns through mathematical modelling”. Cameron Smith (Bath – Maths – PhD student) – “Hybrid methods for simulating stochastic reaction diffusion processes”. Adam George (Bath – Maths – MMath student) – “Developing a blending hybrid method for reaction-diffusion processes”. Dr Michael Bentley (Oxford – Plants – PhD student 2012-2016) – “Molecular evolution of cooperative traits in bacteria”. Mr George Chappelle (Bath – Maths – M.Math. and REP_MB summer placement) – “Representing cell-cell pushing in models of cell migration”. Mr Jonathan Harrison (M.Math. 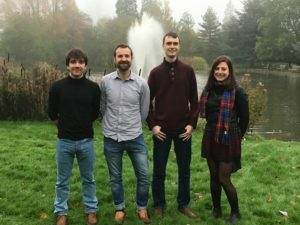 and Nuffield/LMS Undergraduate Research Bursary 2013/14) – “A stochastic-deterministic hybrid model for representing reaction-diffusion equations”. Mr Tom Howe (Bath – M.Math. 2015) – “Developing hybrid PDE-volume exclusion process models for cell migration”. Mr Dan Humphries (Oxford – DTC 2014) – “Mathematical modelling of cytonemes for morphogenesis”. Dr Chris Lester (Oxford – Maths – PhD student) – “Stochastic modelling of biochemical reaction networks”. Miss Jennifer Owen (Bath – M.Math. 2016) – “Modelling embryonic cell migration in mouse development”. Mr Andrew Parker (Oxford – DTC 2014) – “Incorporating pushing in exclusion process models of cell migration”. Mr Christopher Paroussis (Oxford – M.Sc. 2012) – “Multi-level Monte Carlo methods for biological systems”. Mr Kamran Pentland (Bath – Maths – REP_MB summer placement) – “Developing a blending hybrid method for reaction-diffusion processes”. Mr James Peters (Oxford – M.Math. 2014) – “Pushing in exclusion process models of cell migration”. Dr Robert Ross (Oxford – Maths – PhD student 2013-2016) – “Modelling cell migration, proliferation, and interactions on growing domains”. Mr Konstantinos Sakellariou (Oxford – M.Res. 2012) – “Investigation of cellular dispersal in perineural tumour invasion through random walk models”. Mr Cameron Smith (Bath – M.Math. 2016) – “Hybrid methods for simulating diffusion on fixed and growing one-dimensional domains”. Dr Paul Taylor (Oxford – Maths – PhD student 2013-2016) – “Stochastic lattice models of diffusion in biological systems”. Mr Jake Taylor-King (Oxford – M.Sc. 2013) – “Hard-sphere velocity-jump processes: applications to swarm robotics”. Dr Robin Thompson (Oxford – M.Math. and Nuffield Foundation Undergraduate Research Bursary 2011) -“Modelling cell migration and adhesion during development”. Mr Jack Twomey (Bath MSc) – “Stochastic Modelling of bimolecular reactions”. Dr Annekatherine Wilkins (Oxford – Biochemistry – PhD student 2013-2017) – “Caenorhabditis elegans as a vector of repellent pathogens”.